Mining, coal mining in particular, started thousands of years ago. The easy method used was to find the outcrop (where the coal surfaced) and follow it, removing the coal as you mined. This developed into bell pits so named because of their shape. Miners would mine straight down until they reached the coal seam. They would then open up the void to remove the coal, thus creating the bell pit. The solution to both problems was the same: naked flames! For ventilation the miners discovered that if they lit a fire at the bottom of one of the connected bell pits, air would circulate around the workings. For light to allow them to work they used candles. This solved the immediate problem of air and light but created another - explosions and fires. With coal comes methane (CH4). Methane is explosive between 5 -15% and the naked flames were the ignition source. The recorded figures for a 10-year period between 1870 and 1880 were 2,700 miners (men and boys) losing their lives to explosions alone. The numbers (not recorded) prior to this period would have, if they were available, made very poor reading. The miners discovered that if an individual was brave (or stupid) enough to go around the workings with a naked flame prior to the miners entering the work area, this individual could seek out the methane and ignite it, making it safer for the other miners. The fireman would cover himself from head to foot (hence the name “The Penitent”) in old wet rags to protect himself as much as possible. He would then enter the workings and search out accumulations of methane. Methane is lighter than air and will accumulate in the roof and to the rise in mines. He would ignite these with his flame (a candle on a stick). While this was not a particularly good idea, it was effective up to a point. It reduced the number of miners’ lives put at risk and, if the accumulation of methane was low, the fireman survived. Unfortunately, the fireman had, in most cases, no way of knowing how much methane he was igniting other than to estimate how much could accumulate at the roof or void. If his assessment was wrong and he set off a large volume of methane and explosion, he often paid with his life. This situation could not continue - something had to be done. The challenge went out to the scientific world to come up with a light that could safely be used underground to provide the miners with light without igniting the methane. There was a period where both the weird and the wonderful were tried to solve the problem. Among the weird was the use of dried fish skins. These produced a very ineffective bioluminescence (phosphorescence) to provide light for the miners. Possibly just as weird was the use of bottles filled with fireflies. Charles Spedding came up with the steel mill which consisted of a steel disk, that the miner rotated at high speed. The miner would then press a flint against the spinning steel disc producing a stream of sparks which the other miners would work from. As you can imagine, this method supplied the miner with a minimum of light for a lot of effort usually provided by a young boy. Worse than this was that the sparks produced could still ignite methane, as was discovered in 1785 with an explosion at Wallsend Colliery. One miner, John Selkirk, was killed, but amazingly, the miner who was operating the Spedding Mill survived and provided the evidence that the ignition source for the methane explosion was the Spedding Mill he was operating at the time. William Reid Clanny was the first to come up with a reasonably effective oil lamp. The Clanny lamp used a small glass aperture around the flame with a gauze cylinder above it. Air was blown in by a set of bellows and descended just inside the glass, passing up through the flame in the centre of the lamp. The gauze was so fine it prevented the flame from passing through and therefore it could not ignite the methane. Clanny, an Irish Doctor, presented a paper on his invention to the Royal Society in May of 1813. For his effort he was awarded medals from the Royal Society of Arts. Almost immediately following Clanny’s paper being presented, two improved flame safety lamp designs followed. Which one came first has been disputed ever since. The two people involved were George Stephenson from the North East of England and Humphrey Davy from Cornwall. George Stephenson was a renowned Civil and Mechanical Engineer. He was famous (amongst many things) for his involvement in the railways. Due to the fact Stephenson did not have a scientific background many people, Humphrey Davy included, disputed that he could have invented the flame safety lamp. Stephenson’s lamp allowed air to enter via small holes through which the flame could not pass. Stephenson confidently proved the effectiveness of his lamp at Killingworth Colliery (December 1915) by holding it in front of a methane blower (methane under pressure) with no ignition of the methane. If he had got his design wrong, what might have happened to the railways? In the meantime, approximately one month after Stephenson’s demonstration at Killingworth, Davy trialled his lamp at Hepburn Colliery (January 9, 1916). Davy had presented information on his lamp to the Royal Society on November 9, 1815. He was awarded the Rumford Medal and £2,000 (£150,000 today) for his efforts. Davy’s lamp utilised a gauze screen to surround the flame on his lamp. Stephenson was accused of stealing Davy’s invention. Following an inquiry, Stephenson was exonerated and awarded £1,000, but this was never accepted by Davy even though a House of Commons Committee found that Stephenson had an equal claim to Davy for the invention of the Flame Safety Lamp. All that said, the lamp recognised today is the Davy lamp and the name most closely associated with its invention is that of Sir Humphrey Davy. It was then discovered that the Davy lamp could also be utilised to test for methane in the mine atmosphere. If methane was present in the mine either in accumulations to the rise or in the ventilation general body, the flame of the Davy lamp burned higher with a blue tinge. Some lamps were equipped with a metal gauge to measure the height of the flame thus giving a percentage of methane present. Mining law was developed to ensure a margin of safety was introduced to protect the miners (remember, methane is explosive between five and fifteen percent; above fifteen percent, the methane has displaced oxygen and prevents ignition). These lamps had to be an intrinsically safe design applied to electrical equipment and wiring, specifically for hazardous locations such as coal mines. The technique is based on limiting energy, either electrical or thermal, to a level below that required to ignite a specific hazardous atmospheric mixture. Around the 1880s, Britain, Germany and America were developing battery powered miners’ cap lamps. These early lamps were heavy and the illumination produced was poor. Development continued over the next 20 years with little progress. Two major explosions at Whitehaven and Hutton, thought to have been caused by misuse or poor maintenance of flame safety lamps, resulted in 500 miners’ lives being lost. A coal owner, Sir Arthur Markham, decided this situation and loss of life was unacceptable and he announced a competition with a prize of £1,000 for the design of a safe lamp for mining. The first battery powered lamp to receive Home Office approval was the one that finished second in this competition. This was the Oldham Type C electric safety lamp. These early electric safety lamps looked, in shape and size, like the original flame safety lamps. These were hung up and provided illumination all around the workplace. Development of these lamps continued and involved reducing the weight and improving the illumination for the miner. In 1930, the first of the miner’s electric cap lamps was designed. This was a giant leap forward allowing the miner to direct the light from his lamp to where he needed it. This was better for production and more importantly offered a vast improvement in safety. The batteries used in these lamps were alkaline. One problem with these lamps was that they leaked, injuring the miner. The now nationalised coal industry (National Coal Board) made the decision to remove these batteries and replace them with lead acid cap lamps. By the end of the 1950s, 700,000 British miners were using lead acid self-service cap lamps. Self-service meant the miner would use the lamp for his normal working shift and then place it onto a charging rack. When he returned for his next shift his lamp was charged ready for use. The battery for these lamps was worn on a belt around the miner’s waist. A cable went under the miner’s shoulder and up his back to the rear of his safety helmet. At the helmet the cable was attached to the rear and the lamp itself was attached to the front. These lamps continued to be developed, but the improvements were limited to battery and bulb only. Towards the end of the 1990s, the next big step forward was noted. LED and lithium-ion battery designs received ATEX (Hazardous Environment) approval and cordless lamps were designed. These are now the most common miners’ cap lamps in use around the world today. Compressed air powered lamps (ATEX approved) were designed for use in gassy mines. The lamp is powered by compressed air, which drives a turbine wheel contained within the lamp body. The turbine produces electricity to power the lamp bulb. These are for use in mine transport and fixed installations. 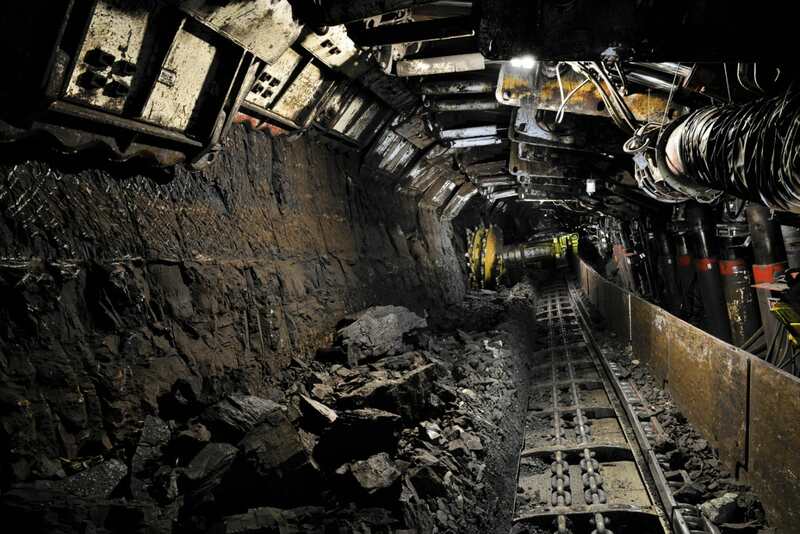 Modern electric lighting is continuing to improve safety and production in mines. The improvement this brings to the miners’ working environment is obvious. The miner still relies on his, now cordless, cap lamp for safety should the power go off or when he is moving around the mine. Providing miners with a safe and yet powerful form of lighting for use in one of the most hazardous environments encountered has taken a lot time, effort and initiative. A lot of miners lost their lives and were injured while this development in safe lighting was going on. A lot of lives and injuries have now been saved by this time, effort and initiative. Therefore, it has been worthwhile.